The author descending into the tunnel that leads to Coney Island’s magnificent Wonder Wheel. In addition to being Valentine’s Day, February 14 is also National Ferris Wheel Day. This unofficial national holiday is held on this day to honor the birth of the inventor of the Ferris Wheel, George Washington Gale Ferris, who debuted his attraction at the 1893 Chicago World’s Fair. “You killed Valentino so you could get close to me?” she asked. Choronzon’s voice was near. He wasn’t on the third tier—he had never left the first! Piper spun around in her bare feet, but she wasn’t fast enough. Valentino’s form leaped from behind one of the carousel’s ornately carved benches. His soft hands grabbed her throat and they both toppled off the whirling machine. They hit the boardwalk hard and Choronzon rolled on top of her. His black eyes pleaded with Piper’s but his hand remained on her neck. Piper gave him a frantic nod. Choronzon released her neck and stood. With a forceful lurch, he yanked Piper to her feet. Then, holding her wrists tightly behind her back, he jostled her down the boardwalk. 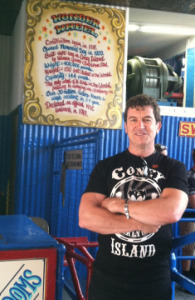 The author at the loading station to the Wonder Wheel. Before them, the Wonder Wheel rose one hundred fifty feet into the air. The sign at the center of the wheel was dark and none of the bulbs on its perimeter were lit. But Piper could make out the twenty-four enclosed cars as if it were the middle of the day. Eight of those cars were suspended from the wheel’s outer frame, like those on a traditional Ferris wheel. The other sixteen cars, however, hung from inner spokes so they could slide back and forth on tracks as the giant wheel rotated. Piper felt the wind pick up and heard it whistling through the spokes. Choronzon shoved Piper down the entrance ramp. When they reached the loading station, he opened the door to one of the swinging cabins and thrust Piper into the rear seat. Then he sat down in the front seat and closed the screened door. With a wave of Choronzon’s hand, the Wonder Wheel’s engine growled to life and all its light bulbs ignited in sequence. Then he twirled his finger and the motor went into gear. The cabin began to rise into the windy night. The car slid on its track toward the center of the wheel and began to swing. When it reached the top, the howling wind rocked it even more. Choronzon turned in his seat so he could address her. Choronzon curled his ruby lips upward. Like an unruly child who had never ridden a Ferris wheel, he threw himself back and forth to make it rock. Some of the Wonder Wheel’s cars hang from inner spokes so they can slide back and forth on tracks as the giant wheel spins. The light bulbs on the edge of the wheel blurred. Beyond them Piper could make out white-capped waves pounding the beach. “Margery,” Piper said, looking off in the distance like the name offended her. On any other night, the view of the boardwalk, the ocean, and the Manhattan skyline in the distance would have been spectacular. “Khafra and Nitocris,” Piper muttered, remembering Houdini’s tale. “Aren’t you the clever girl?” Choronzon said, smiling through Valentino’s bright teeth. They were going down now and the swinging car dropped and soared toward the outer edge of the wheel. It was a giddy and odd sensation as the car went careening toward another car in front of it. At the last second, it swung up over the other car and then rebounded backwards. After several back-and-forth movements, the cabin reached the bottom, still rocking but not as much. “But things didn’t go as planned, did they?” Piper said, folding her hands between her legs. Choronzon scowled. The car swept past the ramp and started up again. They were reaching the top for the second time. She wanted to hear this and figured the best way to keep him talking was to provoke him. “You tried to match wits with Houdini…and lost,” she said with a smirk. The wind gusted. The car rocked. Then the rain started. He was yelling so that she could hear him over the wind. The rain was coming in through the screens and pelting them in the face. “I didn’t know the depths of his duplicity until the day we performed the ritual and I realized he had presented me with the wrong jars. Nor had I expected he would create for himself a personal vampire to spy on us—a vampire who had once been his own brother! 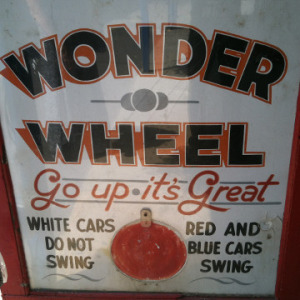 Piper could see the flashing sign at the bottom growing larger as the Wonder Wheel completed another rotation. With a gentle finger upon her chin, Choronzon nudged her head so that she was gazing into his large, black eyes. 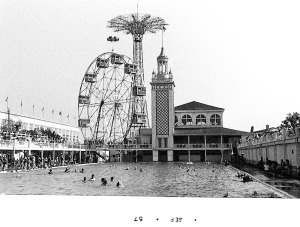 A view of the Wonder Wheel as it looked in 1926. They were going up again, and Piper thought she spotted two figures on the boardwalk running toward the giant Ferris wheel. She kept her eyes fixed on Choronzon’s so he wouldn’t spot them. The demon, however, was too engrossed in telling his tale to notice anything going on outside the cabin. The caged cabin reached its zenith and a gust of wind shook it again. The rain pelted the roof. Piper’s body was shaking, but she wasn’t sure if she was shivering or trembling. “But your ‘experiment’ didn’t work out either, did it?” Piper said, folding her arms across her chest. Despite the peril of her situation, she was enjoying how furious she was making the demon. Choronzon shook his head and made a sound like a snarl. Piper recalled the three flittering objects that had bombarded Mina’s inflated belly upon the altar. But she said nothing because she feared Choronzon would stop talking if he knew that she had been present at her own birth. “What ultimately took custody of your body I know not—perhaps some unholy synthesis of all three. But I was convinced we had succeeded in creating our star child, granting Queen Nitocris a foothold in this world. The Wonder Wheel was dropping again. Piper felt a lurch in her stomach but not because of the ride. Again, they reached the bottom and Piper’s heart sank. Nobody was standing at the loading platform. The two people she had seen must have assumed there was nothing peculiar about the Wonder Wheel operating at this hour. No one was coming to her rescue. “But at the expense of our souls, right?” Piper asked, remembering her conversation with Margery. The wind howled. The cabin rocked. Choronzon shook his head. Piper gaped at him and her whole body went rigid. She was about to stand up in the cramped cage so she could slap the smile off Choronzon’s repulsively beautiful face. Then over his shoulder, she spotted something moving. As the wheel lifted them up, Piper could make out something crawling like a giant caterpillar along one of its struts. Piper twisted her mouth in disgust. She kept trying to peer through the rain without drawing Choronzon’s attention. There was no doubt about it. Someone was crawling on the strut just above—now below—the rail on which her own cabin swayed. Which meant that Sal was close by! Piper continued to hold his attention with her eyes as Henri pulled himself across the strut. The slick metal and the wheel’s movement had no effect on the zombie at all. And why would it? Henri had no fear and his muscles never tired. Choronzon caught Piper’s roving eye. He turned and pressed himself against the rear screen. It wasn’t the response Piper was expecting. Their car swept past the loading point and there was Sal standing on the ramp whispering commands into his wanga. He shot Piper a look and pointed in the opposite direction of the passing wheel. What did he want her to do? Choronzon glanced at Sal and then at Piper as the cabin started its journey up again. Lightning flared as they reached the top, casting Henri’s body in a spotlight of blue as he pulled himself to a standing position atop the cabin in front of them. A peal of thunder followed and Piper realized what Sal wanted her to do. They were going back down, which made the cabin slide in the direction that Sal had been pointing. Henri’s cabin, however, did not move. With Choronzon’s back turned toward her and his attention focused on Henri, Piper lunged at the demon with all her might. “Thanks for the offer, Rudy…” she shouted. The momentum of the rocking cabin amplified the brunt of her impact, hurling Choronzon through the front screen. Choronzon disappeared through the steel mesh but his hand held firmly onto the front edge of the cabin. Piper leaned over the edge and saw him dangling several feet above the next car. Henri clawed at the demon’s kicking feet as the car rocked back and forth. Choronzon’s eyes pleaded with her but their desperation had nothing to do with his predicament. His voice held a richness to it like the distant chimes of the El Dorado. Piper looked at him more closely. She was astonished at the change she saw, for his eyes wore a new expression. They were incredibly tender now and moist with tears. She had never seen so much unhappiness in someone’s eyes and an overwhelming remorse seized her. Choronzon’s feet dragged along the ramp as the car once more flew past the bottom, but he continued to hold on as they swept past Sal. Henri was now above them as they rose back into the air. “And why would I do that?” Piper asked, ready to pry his fingers off the rim. Just then, Henri leaped from his car and snatched the demon around the waist. Choronzon faltered and lost his grip. Zombie and demon fell to the earth but neither struggled nor screamed. Then both bodies hit the boardwalk with a sickening crunch. The wind blew. 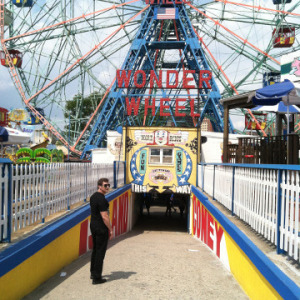 The Wonder Wheel creaked in protest. Piper’s cabin started back down. Tagged #, #aleister_c, #ChoronzonClub, #ChoronzonTheAby, #clairific77, #DirtyLaundryBar, #MisterACrowley ‏, #NationalFerrisWheelDay, #NotRudolphValen, #r_valentino1, #Rudolph_VA, #RudolphValenti8, #rudyfan, #rudyvalentino31, #RValentiino, #‏ScreensGod, #thelemapodcast, #us9_monetti_, #us9_vannBY, #valentinesday, #Valentino, #WonderWheelPark, Choronzon.